Worldwide foreign direct investment (FDI) inflows continued their upward climb in 1997 for the seventh consecutive year. Seemingly unaffected by the Asian financial crisis, they increased by 19 per cent to a new record level of $400 billion, while outflows reached $424 billion (table 1). The capital base of international production in 1997, including capital for direct investment purposes drawn from sources other than transnational corporations (TNCs), is estimated to have increased by $1.6 trillion in 1997. The upward trend in investment flows supported further the expansion in international production. In 1997, the value of international production, attributed to some 53,000 TNCs and their 450,000 foreign affiliates, was $3.5 trillion as measured by the accumulated stock of FDI, and $9.5 trillion as measured by the estimated global sales of foreign affiliates. Other indicators also point in the same direction: global exports by foreign affiliates are now some $2 trillion, their global assets $13 trillion, and the global value added by them more than $2 trillion. These figures are also impressive when related to the size of the global economy: the ratio of inward plus outward FDI stocks to global GDP is now 21 per cent; foreign affiliate exports are one-third of world exports; and GDP attributed to foreign affiliates accounts for 7 per cent of global GDP. Sales of foreign affiliates have grown faster than world exports of goods and services, and the ratio of the volume of world inward plus outward FDI stocks to world GDP has grown twice as fast as the ratio of world imports and exports to world GDP, suggesting that the expansion of international production has deepened the interdependence of the world economy beyond that achieved by international trade alone (figure 1). … with the 100 largest TNCs in the world having become highly transnationalized and the 50 largest developing country TNCs catching up. 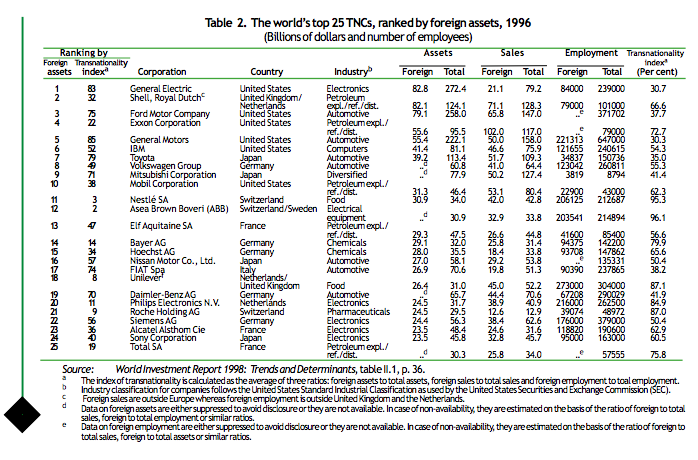 The world’s 100 largest TNCs (see table 2 for the top 25 of those firms) show a high degree of transnationality as measured by the shares of foreign assets, foreign sales and foreign employment in their total assets, sales and employment. The top 50 TNCs headquartered in developing countries (see table 3 for the top 25 of those firms) are catching up rapidly. The composite index that combines all three shares bears this out: the top 50 TNCs headquartered in developing countries have built up their foreign assets almost seven times faster than the world’s top 100 TNCs between 1993 and 1996 in their efforts to transnationalize. The transnationality index of the former was 35 per cent in 1996, while that of the latter was 55 per cent. While the value of the index for the top 100 TNCs is higher, it did not change significantly between 1990 and 1995. In contrast, the value of the index for the top 50 developing country TNCs has been increasing steadily throughout the 1990s. Naturally, there are significant differences by type of industry, with telecommunications, transport, construction and trading being the most transnational in the case of the top 50 developing country TNCs, while food and beverages, chemicals and pharmaceuticals, and electronics and electrical equipment were the most transnational among the world’s top 100. The ranking of TNCs by the different transnationality indexes also differs: although General Electric tops the list of the largest 100 TNCs ranked by the size of foreign assets, Seagram ranks first in the composite index of transnationality. Likewise, Daewoo Corporation topped the list of the 50 largest developing country TNCs by foreign assets, but Orient Overseas International ranked first in the composite index of transnationality. Not surprisingly, firms at the top of the composite transnationality index are from countries with small domestic markets. The impressive numbers documenting the growth of international production disguise considerable variation across and within regions. There is no doubt that the developed countries, with more than two-thirds of the world inward FDI stock and 90 per cent of the outward stock, dominate the global picture, but their dominance is being eroded (table 4). 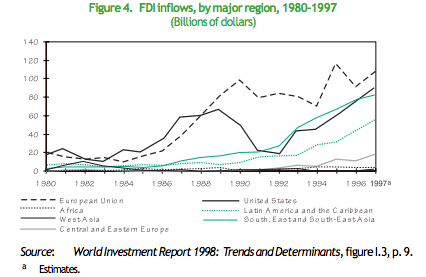 Developing countries accounted for nearly a third of the global inward FDI stock in 1997, increasing from one-fifth in 1990. It is in flows of inward FDI that developing countries have made the biggest gains over the 1990s, with their values as well as shares of global inflows increasing markedly: from $34 billion in 1990 (17 per cent of global inflows) to $149 billion in 1997 (37 per cent of global inflows) (table 5). 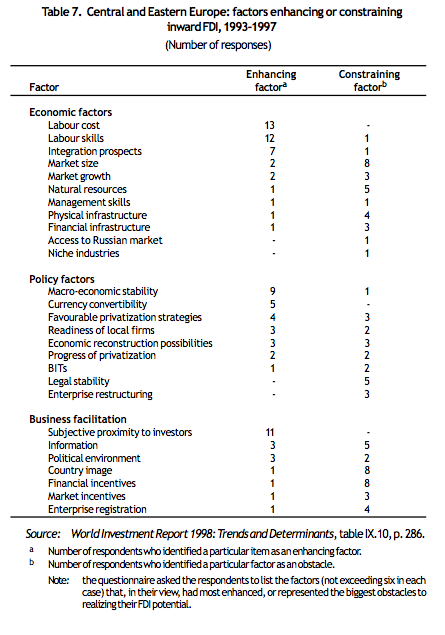 …despite the strong investment performance of developed countries in 1997. Continued strong economic growth in the United States, improved economic performance in many Western European countries, and the mergers-and-acquisitions (M&As) boom are the principal reasons for the acceleration of inflows to developed countries in 1997 (an increase of almost a fifth over 1996, to $233 billion). The United States received $91 billion in inflows, accounting for more than one-fifth of global inflows, and invested $115 billion abroad during the year. Among the countries of the European Union, the United Kingdom received $37 billion (just under a tenth per cent of global inflows) in 1997; in contrast, for the second successive year, Germany registered net FDI withdrawals. Outflows from the European Union were $180 billion in 1997, and a renewed interest in European integration prompted by the expected advent of the Euro in 1999 led to a spurt in the share of investment directed to member countries. Japan received $3 billion in 1997, a record figure, though still low compared to other developed economies, and invested $26 billion abroad. Worldwide cross-border M&As, mostly in banking, insurance, chemicals, pharmaceuticals and telecommunications, were aimed at the global restructuring or strategic positioning of firms in these industries and experienced another surge in 1997. 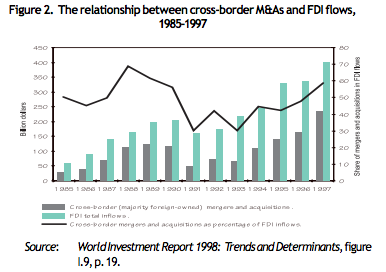 Valued at $236 billion, majority-owned M&As represented nearly three-fifths of global FDI inflows in 1997, increasing from almost a half in 1996 (figure 2). Many of the 1997 M&A deals have been large and 58 of them were each worth more than $1 billion. The United States, followed by the United Kingdom, France and Germany, accounted for the biggest share of the large M&A deals. Together, developed countries accounted for about 90 per cent of the worldwide majority-owned M&A purchases. These deals are not only a major driver of FDI flows for developed countries, but also shed light on the prevailing strategies of TNCs: divesting noncore activities and strengthening competitive advantages through acquisitions in core activities. These strategies have been made possible by liberalization (including the WTO’s financial services agreement in 1997) and deregulation (e.g. in telecommunications). One outcome is a greater industrial concentration in the hands of a few firms in each industry, usually TNCs. TNCs are achieving their goals of strategic positioning or restructuring not only through M&As but also through interfirm agreements. A subset of such agreements involves technology-related activities and is a response to the increased knowledge-intensity of production, the shortening of product cycles and the need to keep up with the constantly advancing technological frontier. Such agreements are particularly important for enhancing the technological competitiveness of firms and their number has increased from an annual average of less than 300 in the early 1980s to over 600 in the mid-1990s. An estimated 8,260 inter-firm agreements in technologyintensive activities have been concluded between 1980 and 1996. Given their emphasis on technology or joint R&D development, it is not surprising that inter-firm agreements are prominent in knowledge-intensive industries, such as the information industry and pharmaceuticals and, more recently, in automobiles. 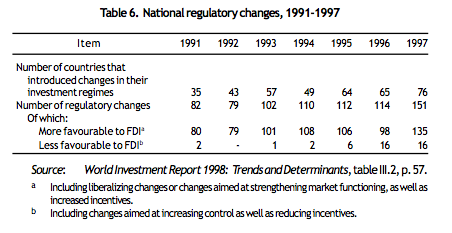 During 1997, 151 changes in FDI regulatory regimes were made by 76 countries, 89 per cent of them in the direction of creating a more favourable environment for FDI (table 6). New liberalization measures were particularly evident in industries like telecommunications, broadcasting and energy that used to be closed to foreign investors. New promotional measures included streamlining approval procedures and developing special trade and investment zones (adding to the many such zones already in existence). 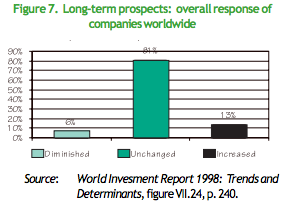 During 1997 alone, 36 countries introduced new investment incentives, or strengthened existing ones. 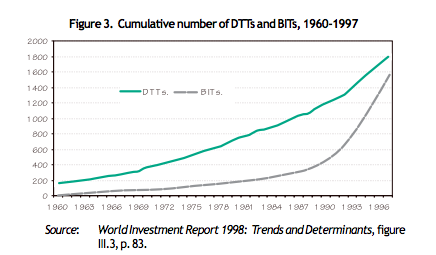 The network of bilateral investment treaties (BITs) is expanding as well, totalling 1,513 at the end of 1997 (figure 3). In that year one BIT was concluded, on the average, every two-and-a-half days. The number of double taxation treaties also increased, numbering 1,794 at the end of 1997, with 108 concluded in 1997 alone (figure 3). The common thread that runs through the proliferation of both types of treaties is that they reflect the growing role of FDI in the world economy and the desire of countries to facilitate it. Discussions of regional initiatives are taking place in most regions in the context of new or existing agreements. On the American continent, negotiations on the Free Trade Agreement of the Americas (FTAA), intended to incorporate a comprehensive framework of rights and obligations with respect to investment, have been launched. If successful, the FTAA will consolidate and integrate the various free trade and investment areas already present in the region. In Asia, the ASEAN Investment Area is scheduled to be established later this year. However, the approach of the ASEAN Investment Area is different from that of other regional initiatives in that it emphasizes policy flexibility, cooperative endeavours and strategic alliances and avoids, at least for now, legally binding commitments. In Africa, there are preliminary discussions on new regional initiatives on investment in the context of the Southern African Development Community (SADC) and the Organization of African States. …as governments engage in broad-based and wide ranging discussions on international investment agreements and their development implications. The ongoing negotiations on a Multilateral Agreement on Investment at the OECD reached a critical point in 1998 after two years of negotiations, when pressures grew to make them more transparent and to initiate a broad-based public debate on FDI issues. Partly reflecting this situation, a pause for reflection until October 1998 was agreed to by the OECD ministers. Wide-ranging discussions at the multilateral level have, meanwhile, been taking place mainly in the WTO and UNCTAD. The work of the WTO Working Group on the Relationship between Trade and Investment is focusing on the economic relationship between trade and investment; the implications of the relationship for development and economic growth; existing international arrangements and initiatives on trade and investment; and issues relevant to assessing the need for possible future initiatives. UNCTAD, on the other hand, is seeking to help developing countries participate effectively in international discussions and negotiations on FDI, be it at the bilateral, regional or multilateral level. In pursuing this objective, UNCTAD is paying special attention to identifying the interests of developing countries and ensuring that the development dimension is understood and adequately addressed in international investment agreements. 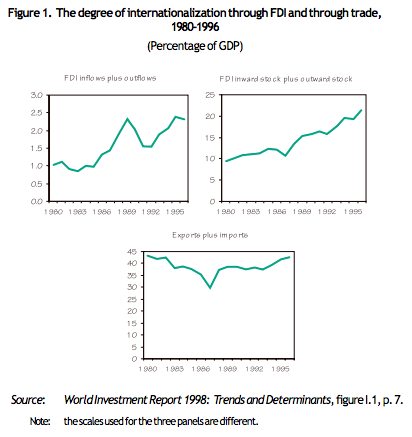 Although smaller than those of developed countries, the increases in 1997 in FDI flows into developing countries are noteworthy because they took place in an environment that presented a complex mix of adverse changes. 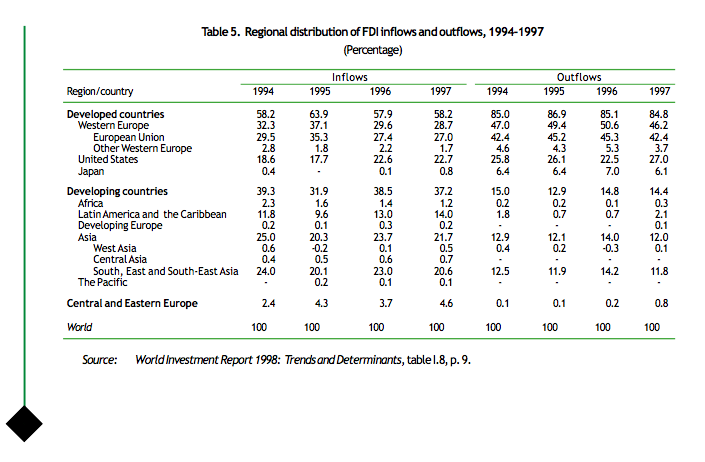 Unlike other net resource flows such as official development assistance or some other types of private capital, such as portfolio equity investment, FDI inflows increased in 1997, with no developing region experiencing a decline in the level of inflows figure 4). A new record level of $45 billion in FDI flows received by China contributed to the 9 per cent increase in total FDI flows to Asia and the Pacific in 1997. With $87 billion in 1997, Asia and the Pacific accounts for nearly three-fifths of the FDI inflows received by all developing countries, and for over a half of the developing-country FDI stock. East and South-East Asia, the subregion most affected by the financial crisis in Asia during the second half of the year, also saw a small increase of 6 per cent to $82.4 billion in 1997 but this trend is unlikely to continue in 1998. The five Asian economies most affected by the crisis saw their combined FDI inflows remain at a level almost unchanged from that in 1996. With inflows totalling $2.6 billion in 1997, largely concentrated in oil-producing Kazakhstan and Azerbaijan, Central Asia has become a more important destination for FDI than West Asia, which received $1.9 billion in 1997. China’s current FDI boom, now in its sixth consecutive year, is showing signs of coming to an end. The rate of increase of FDI inflows declined to 11 per cent in 1997 from an average of 147 per cent between 1992 and 1993. 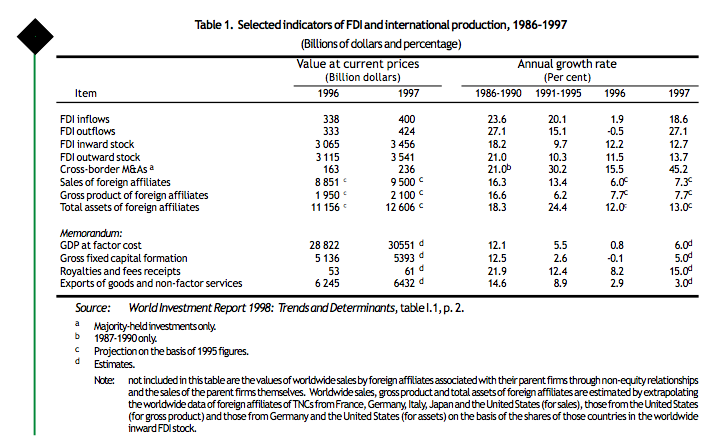 Furthermore, FDI approvals have fallen from $111 billion in 1993 to $52 billion in 1997. The expectation of a decline is based on several aspects of the national and regional economy: a slowdown in economic growth from its exceptional performance of the past few years; excess capacity in several industries due to over-investment or weaker demand conditions; wage increases in the coastal areas that are eroding its locational advantage in low-cost labour-intensive investments; poor infrastructure in the interior provinces that hinders investment in low-wage activities; currency depreciations in other economies that are eroding the price competitiveness of foreign affiliate exports; and adverse economic conditions in its biggest FDI source economies in Asia (Hong Kong, China, Japan, the Republic of Korea, Malaysia and Thailand), which constrict their outward flows to China. While these considerations suggest an impending decline in FDI flows to China, ongoing FDI liberalization, massive infrastructure building, foreigninvestor participation in the restructuring of state-owned enterprises and a continued strong growth performance compared with other countries in the region could yet mitigate the expected drop. 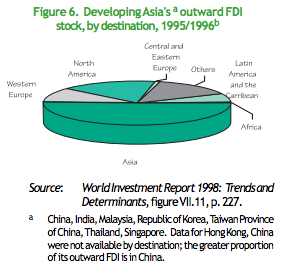 FDI outflows from Asia and the Pacific increased by 9 per cent in 1997 to $50.7 billion. The biggest investor is Hong Kong, China, with an outward stock of $137.5 billion in 1997. China and Indonesia experienced large increases in outflows, with big projects in natural- resource-seeking investments, while firms from Singapore and Taiwan Province of China were actively involved in acquisitions of firms in crisis-afflicted countries. TNCs from the Republic of Korea, Malaysia and Thailand had a much lower profile, as a number of their FDI expansion projects were scaled down or put on hold. The FDI pattern emerging in Asia and the Pacific is characterized by a decline in intra-regional investment, as many of the region’s TNCs grapple with mounting debts and other difficulties. On the other hand, European TNCs, having largely neglected Asia until recently, are now taking an active interest in the region. The region’s FDI pattern is also characterized by an increasing share of FDI received by the services sector, partly because of liberalization but also in direct response to efforts by some host countries to become regional investment hubs. Finally, M&As are gaining in importance as a mode of investment in Asia and the Pacific, partly in response to corporate restructuring in the countries directly affected by the financial crisis. … although the implications of the crisis for FDI in the most affected countries are a matter for concern. For Asia, and especially the five Asian countries — Indonesia, Malaysia, Philippines, Thailand and the Republic of Korea — stricken by the financial crisis in the second half of 1997, the most important question relating to foreign investment is how the crisis and its economic consequences will affect inward FDI in the short and medium term. FDI plays an important role in the region and could thus assist the countries in the process of their economic recovery. FDI flows to the region have been quite resilient in the face of the crisis, remaining positive and continuing to add to the capital stock of the affected countries while other capital flows, including bank lending and portfolio equity investment, fell sharply and even turned negative in 1997 as a whole (figure 5). This is not surprising given that FDI is investment made with a long-term interest in production in host countries, in order to enhance the competitive positions of TNCs. Nevertheless, neither FDI flows nor the activities of foreign affiliates in the region, in particular in the five most affected countries, can remain impervious to the changes that the crisis has set in motion. Indeed, the crisis and its aftermath have changed a number of factors that influence FDI and TNC operations in the affected countries, at least in the short and medium term. Some of the changes are actually conducive to increasing FDI flows to the affected countries. One is the decrease for foreign investors in the costs of acquiring assets whose prices have fallen. In addition, the availability of firms seeking capital and the liberalization of policy with respect to M&As makes the entry of foreign investors through the acquisition of assets easier than before. All this makes it easier for TNCs to enter or expand their operations at the present time, if they can afford to take a long-term view of the market prospects in the region or if they produce for export rather than domestic or regional markets. Firms interested in strategic positioning in Asia and the Pacific or seeking created assets to complement their worldwide portfolio of locational assets might find it attractive to establish or expand operations in these countries at the present time. There is evidence that firms from the United States, Western Europe and less affected economies in the region have taken the opportunity to invest in the crisisaffected countries, especially in Thailand and the Republic of Korea. The increasing importance of M&As as a mode of entry may, however, give rise to concerns over the loss of national control over enterprises; these need to be taken seriously, so as to avoid a backlash. A second factor conducive to increasing FDI in the most affected Asian countries is the improvement in their international cost competitiveness due to devaluations. This is especially relevant for export-oriented FDI and there are already signs that investors are responding to the changes in the relative costs of production. FDI in export-oriented industries (such as electrical and electronics manufacturing) has risen in Thailand — as it had in Mexico after the Peso crisis — while production for export by foreign affiliates already well established in both Thailand and Malaysia seems to be increasing. TNCs in the affected Asian economies, which are already highly export-oriented in certain industries, can take advantage of their corporate systems of integrated international production to strengthen their export orientation substantially, especially in the short and medium term. The potential positive impact of both lower asset prices and decreased operational costs on inward FDI could be enhanced by the liberalization moves and promotional efforts that are being made by the affected countries. Governments in the countries most affected by the crisis, most of which already have fairly liberal frameworks for FDI, have further liberalized their FDI regimes, opening new areas and relaxing rules, including in the context of IMF adjustment programmes. They have also intensified their efforts to attract FDI both individually and collectively. … others will affect it adversely. On the other hand, some consequences of the crisis will affect FDI adversely in the short and medium term. For firms focused on domestic or regional markets, reduced demand and slower growth can be expected to lead to some cancelling, scaling down or postponement of FDI in the most affected countries. However, the impact on domestically-oriented foreign affiliates varies among industries. Foreign affiliates in the services sector are particularly susceptible to local demand conditions, because of the non-tradability of most services. Affiliates producing goods and services that depend mainly on imported raw materials and intermediate inputs would be more seriously affected than those relying on domestic sources. The automotive industry, in which TNCs figure prominently in the region, is a good example of the impact of the crisis and the range of responses: a number of automotive TNCs have scaled down, postponed or even cancelled investment projects in some of these countries; firms have also adopted various other measures to cope with the crisis, including injecting funds to help their financially distressed affiliates and subcontractors, relocating parts production, boosting exports and increasing domestic sourcing. The implications of the financial crisis for inward FDI are also likely to extend to other, less seriously affected, developing countries in Asia. For one thing, some countries, especially those with close economic links to the countries most affected by the crisis, are likely to experience lower economic growth; some countries may also lose export competitiveness vis-à-vis the countries that have devalued. These factors could reduce their attractiveness as host countries, at least in the short run. Furthermore, and most importantly, many Asian developing countries, including China, Viet Nam and the least developed countries of the region, depend heavily on FDI from other developing Asian countries (figure 6) and inward FDI flows to them could decrease because of a decrease in outward FDI from the countries affected by the crisis. 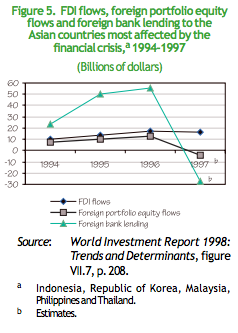 In 1997, overall outward FDI from developing Asian economies rose, but flows decreased from all the five crisisaffected countries except Indonesia. The crisis is likely to reduce the financial capacities of Asian TNCs (including TNCs from Japan) to undertake FDI on account of valuation losses, increased debt burdens on foreigncurrency denominated loans, and reduced profitability of operations due to contraction of demand. The impact of these factors is further compounded for some TNCs by a credit crunch at home and difficulties in raising funds abroad. …making it difficult to predict the overall impact on FDI in the region in the short and medium term, although long-term prospects remain sound. It is difficult to predict how the various factors set in motion by the crisis will affect, on balance, inward FDI to the crisis-stricken countries and to the region as a whole in the short and medium term. Despite their overall resilience, flows to the affected countries and to the region as a whole may well fall in 1998, but much depends on the extent to which the financial crisis spills over into the real sector. Aside from that, given that the FDI determinants proper — regulatory frameworks, business facilitation and, most importantly, economic determinants of long-term growth — are attractive, and that the changes resulting from the crisis have positive as well as negative implications for FDI, there is room for cautious optimism. However, the extent to which these various factors translate into actual flows will depend on the assessment by TNCs of the long-term prospects of the region in the context of their own strategies for enhancing competitiveness. If their assessment is negative, TNCs will be reluctant to invest, especially as far as market-seeking FDI is concerned, and cautious in acquiring assets in the region. If they take a positive view and take advantage of the crisis to position themselves strategically in the region, FDI flows to Asia will continue on their upward trend without serious interruption. The rationale for the latter view is that the fundamental features of the region as a destination for FDI remain sound. These same features suggest not only that longer-term FDI prospects for the region remain positive, but that they may even improve as countries strengthen certain aspects of their economies in response to the crisis (figure 7). The turnaround in FDI flows to Latin America and the Caribbean that occurred in the early 1990s was further strengthened in 1997: the region received $56 billion (figure 4) — an increase of 28 per cent over 1996 — and invested a record $9 billion abroad. The increase in inflows accounted for twothirds of the overall increase in inflows to all developing countries. Apart from sustained economic growth and good macroeconomic performance, key factors in the region’s FDI boom were trade liberalization, wide-ranging privatization, deregulation and regionalization. With more than $16 billion in inflows, Brazil emerged as the region’s champion in 1997, surpassing Mexico with $12 billion and Argentina with $6 billion. Despite the growing role of Asian and intraregional FDI, the United States is still the largest investor in Latin America and the Caribbean, with its investment in the region reaching $24 billion in 1997, mostly in automobiles, electronics, apparel and other manufacturing. MERCOSUR has given a boost to both intraregional and extraregional FDI. Global competition and market expansion are prompting TNCs from Europe, the United States and Asia to invest in the growing MERCOSUR market, particularly in automobiles and chemicals. In contrast, most of the manufacturing FDI in Mexico and the Caribbean Basin has been efficiency-seeking, with the United States market being the final destination of exports. In the services and primary sectors, privatization programmes have provided opportunities for expansion for both market-seeking and resource-seeking TNCs. Government policy has also played a crucial role in generating the conditions under which the current FDI boom in Latin America and the Caribbean has occurred. Latin America’s strong FDI performance has been accompanied by changes in the nature of the investment it receives. First, there are some signs that TNC activities in Latin America have become more export-oriented, as witnessed by the sizeable contributions of TNCs to the region’s exports and by increases in the export propensity of United States manufacturing affiliates. Structural reforms, macroeconomic stabilization and adequate macroeconomic management have also contributed to the export performance of foreign affiliates and domestic firms. Primary-sector FDI, still important in a number of countries, is almost exclusively geared to international markets. Services FDI, mostly geared to national markets, has given rise to some exports in certain tradable services and may have increased exports indirectly through services-related activities of manufacturing operations. The lion’s share of export creation by foreign affiliates has taken place in manufacturing, in response to the trend towards integrating manufacturing affiliates into global production networks, which can be most clearly observed in Mexico and the Caribbean Basin. The recent FDI boom in Latin America has also been accompanied by large and rising current-account deficits, reviving concerns over a negative balance-of-payments impact. The immediate effects of trade liberalization on the balance of payments may well be negative because FDI tends to generate higher imports not only of capital and intermediate goods, but also of final consumer goods, if TNCs begin by establishing sales affiliates and distribution networks. In the longer run, however, the strengthened export orientation of foreign affiliates should help to improve current account imbalances, especially as import growth normalizes once the adjustment of foreign investors to the new policy environment is completed, and if complementary policies to strengthen domestic capabilities and linkages are also pursued. …but Africa’s performance has remained unremarkable – with some exceptions. FDI flows to Africa have stabilized at a significantly higher level than at the beginning of the 1990s: an average of $5.2 billion during 1994-1996 compared to an average of $3.2 billion during 1991-1993. In 1997, inflows were $4.7 billion, almost the same as in 1996 (figure 4). Judging by data for United States and Japanese affiliates in Africa, the continent remains a highly profitable investment location as companies receive rates of return on their investments that by far exceed those in other developing regions. In addition, almost threefifths of FDI flows from the major home countries of TNCs in Africa — France, Germany, the United Kingdom and the United States — have gone into manufacturing and services since 1989, suggesting that the widely held assumption that Africa receives FDI only on the basis of natural resources is mistaken. While Africa trails other developing regions in attracting FDI, a group of seven countries — Botswana, Equatorial Guinea, Ghana, Mozambique, Namibia, Tunisia and Uganda — stand out in terms of relative FDI inflows and their growth during 1992-1996, not only in comparison to other African countries but also to developing countries as a whole. While natural resources are an important determinant for FDI flows into most of these countries, they are by no means the only explanation for their relative success in attracting FDI. A number of other factors, including fast-growing national markets, access to large regional markets, significant privatization programmes and — in the case of Tunisia — conditions encouraging the location of export-oriented, efficiency-seeking FDI in the country also play a role. What all these “frontrunner” countries have in common is significant progress in improving their regulatory FDI frameworks as well as significant progress in strengthening political and macroeconomic stability. Most of them have also stepped up efforts to create an FDI-friendly business climate, particularly through investment promotion activities. FDI in Central and Eastern Europe has bounced back. Central and Eastern European economies broke their stagnating FDI trend in 1997 — the first year the region as a whole registered a positive GDP growth rate in recent years — by receiving record FDI flows of $19 billion, 44 per cent more than in 1996 (figure 4). This turnaround took place after a decline of 10 per cent in 1996. The Russian Federation was the leading recipient, mainly in natural resources and infrastructure development. In the other Central and Eastern European economies, most of the FDI growth occurred in manufacturing and services. The FDI pattern, however, remains uneven, reflecting the diverse experiences of countries in the transition to market-based economies, the strengthening of regulatory and institutional frameworks relevant for TNC operations, and privatization efforts. As for outflows, with the Russian Federation as the leading outward investor, outflows from Central and Eastern Europe more than tripled in 1997. 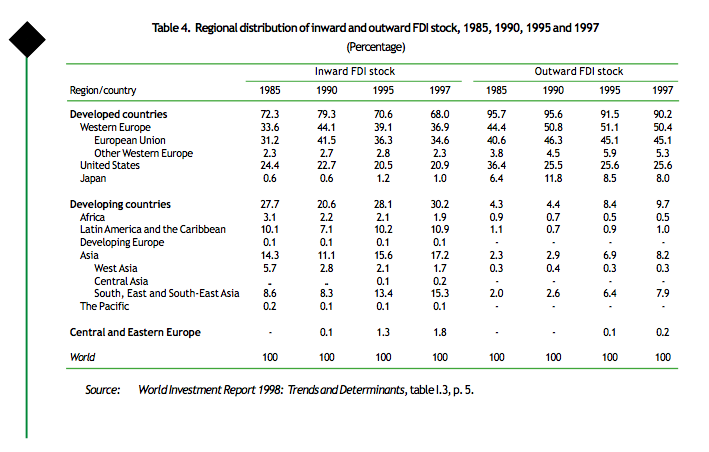 Despite this turnaround, Central and Eastern Europe’s share in world inward FDI stock is still low: 1.8 per cent in 1997 (see table 4). To a large extent, this is explained by the fact that the majority of the countries opened up to inward FDI fairly recently; their accumulated FDI stocks are therefore small. The small stock also reflects the influence of various obstacles such as problems in the legal and regulatory frameworks, a long transition-related recession and a lack of experience in FDI facilitation measures (table 7). The principal determinants of the location of FDI are the policy framework, business facilitation measures and economic factors. To explain the differences in FDI performance among countries and to ascertain why firms invest where they do, it is necessary to understand how TNCs choose investment locations. In general, FDI takes place when firms combine their ownership-specific advantages with the location-specific advantages of host countries through internalization, i.e. through intra-firm rather than arm’s-length transactions. Three broad factors determine where TNCs invest: the policies of host countries, the proactive measures countries adopt to promote and facilitate investment, and the characteristics of their economies (table 8). The relative importance of different location-specific FDI determinants depends on the motive and type of investment, the industry in question, and the size and strategy of the investor. Different motives, for example, can translate into different location patterns depending on the investor’s strategy. The core enabling framework for FDI consists of rules and regulations governing entry and operations of foreign investors, standards of treatment of foreign affiliates and the functioning of markets. Complementing core FDI policies are other policies that affect foreign investors’ locational decisions directly or indirectly, by influencing the effectiveness of FDI policies. These include trade policy and privatization policy. Policies designed to influence the location of FDI constitute the “inner ring” of the policy framework. Policies that affect FDI but have not been designed for that purpose constitute the “outer ring” of the policy framework. The contents of both rings differ from country to country, as well as over time. Core FDI policies are important because FDI will simply not take place where it is forbidden. However, changes in FDI policies have an asymmetric impact on the location of FDI: changes in the direction of greater openness may allow firms to establish themselves in a particular location, but they do not guarantee this. In contrast, changes in the direction of less openness, especially if radical (e.g. nationalizations), will pretty much ensure a reduction in FDI. Since the mid-1980s, an overwhelming majority of countries have introduced measures to liberalize FDI frameworks, with positive effects on inward investment. Globalization and FDI liberalization have exerted mutually reinforcing pressures on each other and the momentum for neither has subsided. This has provided TNCs with an everincreasing choice of locations and has made them more selective and demanding as regards other locational determinants. One outcome is a relative loss in effectiveness of FDI policies in the competition for investment: adequate core FDI policies are now simply taken for granted. Another outcome is that countries are increasingly paying more attention to the inner and outer rings of the policy framework for FDI. The key issue for inner-ring policies is policy coherence, especially the joint coherence of FDI and trade policies. This is particularly important for efficiencyseeking FDI as firms integrate their foreign affiliates into international corporate networks. At the same time, the boundary line between inner- and outer-ring policies becomes more difficult to draw as the requirements of international production make higher demands on the efficacy of the policy and organizational framework within which FDI policies are implemented. Thus, macroeconomic policies (which include monetary, fiscal and exchange-rate policies) as well as a variety of macro-organizational policies become increasingly relevant. As the core FDI policies become similar across countries as part of the global trend towards investment liberalization, the inner and outer rings of policies gains more influence. Foreign investors assess a country’s investment climate not only in terms of FDI policies per se but also in terms of macroeconomic and macro-organizational policies. Among the policy measures that can have a direct effect on FDI is membership in regional integration frameworks, as these can change a key economic determinant: market size and perhaps market growth. In fact, because of this effect, such membership can be regarded as an economic determinant in its own right. Regional integration frameworks may cover a wide spectrum of integration measures, ranging from tariff reduction among members to policy harmonization on many fronts. The inner rings for both inward and outward FDI tend to become similar; in the case of developed countries, this may happen even before regional integration becomes a fact. With developing countries, membership in a regional integration scheme usually requires at least some degree of FDI (or capital movement) policy harmonization. A multilateral framework on investment (MFI) — if it were to be negotiated and if it were to lead to more similar FDI policy frameworks — would underscore the importance of the principal economic determinants and business facilitation measures in influencing location in a globalizing world economy. Even on the policy front, however, the precise impact of a possible MFI would depend on the form it takes, and particularly whether it would merely lock in the FDI liberalization process or further encourage it. Since an MFI is a hypothetical policy determinant, assessments of its possible impact on the actual quantity, quality and geographical pattern of FDI flows must be tentative and could range from scenarios that see no or very little impact, to a negative or positive impact; it must, moreover, be understood that the implications of the various scenarios would vary from country to country in accordance with specific economic and developmental conditions and specific national stances vis-à-vis FDI. If a possible MFI should lock in unilateral liberalization measures, assure greater protection, transparency, stability and predictability, and create pressures for (or even lead to) further liberalization, it would enhance the FDI enabling policy framework and could lead to more investment — if the other FDI determinants were in place. However, it is also conceivable that if an MFI was of a “stand-still” type, it would not create a more liberal policy framework than the one that already exists, and hence, its impact on FDI determinants and flows would be difficult to detect, if there were to be one. Expectations about the impact of a possible MFI — if indeed it were to be negotiated — on FDI flows in comparison to the current regulatory framework and the direction in which it is developing, should therefore not be exaggerated. There are, of course, other issues that would need to be considered in connection with a possible MFI — especially the possible role of such an agreement in providing a framework for intergovernmental cooperation in the area of investment — but these fall outside the scope of the present analysis which is specifically focussed on the determinants of FDI. … while business facilitation measures are becoming relatively more important. It is in the context of a greater similarity of investment policies at all levels that business facilitation measures enter the picture. They include investment promotion, incentives, after-investment services, improvements in amenities and measures that reduce the “hassle costs” of doing business. While these measures are not new, they have proliferated as a means of competing for FDI as FDI policies converge towards greater openness. Furthermore, business facilitation measures have become more sophisticated, increasingly targeting individual investors, even though this involves high human capital and other costs. Among these measures, afterinvestment services can be singled out because of the importance of reinvested earnings in overall investment flows and because satisfied investors are the best advertisement of a country’s business climate. Financial or fiscal incentives are also used to attract investors even though they typically only enter location-decision processes when other principal determinants are in place. Once an enabling FDI policy framework is in place, economic factors assert themselves as locational determinants. They fall into three clusters, corresponding to the principal motives for investing abroad: resource (or-asset)-seeking, market-seeking and efficiency-seeking. In the past, it was relatively easy to distinguish the type of FDI corresponding to each of these motives. Historically, the availability of natural resources has been the most important FDI determinant for countries lacking the capital, skills, know-how and infrastructure required for their extraction and sale to the rest of the world. The importance of this determinant per se has not declined but the importance of the primary sector in world output has declined. In addition, large indigenous, often state-owned, enterprises have emerged in developing countries with the capital and skills to extract and trade natural resources. These changes mean that TNC participation in natural resource extraction is taking place more through non-equity arrangements and less through FDI, although the value of FDI in natural resources has far from declined. National market size, in absolute terms or relative to the size and income of the population, has been another important traditional determinant, leading to market-seeking investment. Large markets can accommodate more firms and allow each of them to reap the benefits of scale and scope economies — one of the principal reasons why regional integration frameworks can lead to more FDI. High market growth rates stimulate investment by foreign as well as domestic investors. Much of the inward FDI of the 1960s and 1970s was drawn by large national markets for manufacturing products, which were sheltered from international competition by tariff barriers and quotas. Large national markets were also important for those services whose non-tradability made FDI the only mode of delivery to consumers. Such investment, however, was initially small because FDI frameworks for services were typically restrictive, excluding foreign investors in many fields such as banking, insurance and most infrastructural services. Largely immobile low-cost labour was another traditional economic determinant of FDI location, particularly important for efficiency-seeking investment. The forces driving globalization are also changing the ways in which TNCs pursue their objectives for investing abroad. Technology and innovation have become critical to competitiveness. Openness to trade, FDI and technology flows, combined with deregulation and privatization, have improved firms’ access to markets for goods and services and to immobile factors of production and have increased competitive pressures in previously protected home markets, forcing firms to seek new markets and resources overseas. At the same time, technological advances have enhanced the ability of firms to coordinate their expanded international production networks in their quest for increased competitiveness. More and more firms are therefore developing a portfolio of locational assets to complement their own competitive strengths when they engage in FDI, as witnessed by the growing number of firms that are becoming transnational. All of these factors are changing the relative importance of different economic determinants of FDI location. The traditional determinants have not disappeared; rather, they are becoming relatively less important in FDI location decisions. The traditional motives for FDI have not disappeared either; they are being incorporated into different strategies pursued by firms in their transnationalization process. These have evolved from the traditional stand-alone strategies, based on largely autonomous foreign affiliates, to simple integration strategies, characterized by strong links between foreign affiliates and parent firms, especially for labour-intensive activities, as well as links between TNCs and unrelated firms via non-equity arrangements. Under simple integration strategies, unskilled labour becomes the principal locational determinant. Complementing it are other determinants, such as the reliability of the labour supply and adequate physical infrastructure for the export of final products. Costs feature prominently, but host country markets do not: it is access to international markets, privileged or otherwise, that matters. Although this type of FDI is not new, it began to prosper under the conditions of globalization. Much of the investment in export processing zones and labour-intensive industries has been in response to simple integration strategies, driven by cost-price competition and, more importantly, the removal of trade (and FDI) barriers in an increasing number of countries and technological advances that permit quick changes in product specifications in response to changes in demand. However, as labour costs declined in relation to total production costs and as FDI in response to simple integration strategies became more mobile, countries had to offer additional locational advantages over and above the availability of low-cost unskilled labour to attract FDI. Productivity and some level of skill, as well as good infrastructure facilities, gained in importance as locational determinants for this type of investment. Access to international markets also became more important. Losing such access could mean losing this type of investment. This contributed to the efforts of many developing countries seeking to gain permanent access to the markets of developed countries through trade agreements or regional integration arrangements. As services became more tradable, particularly in their labour-intensive intermediate production stages such as data entry, they too began to relocate abroad in response to simple integration strategies. The locational advantages sought by such service TNCs included computer literacy and a reliable telecommunication infrastructure. Again, this contributed to the upgrading of the locational advantages that countries could offer to TNCs pursuing simple integration strategies, in their efforts to attract the more sophisticated activities that TNCs were now locating abroad. With more and more TNC intermediate products and functions becoming amenable to FDI, TNCs strategies are evolving from simple to complex integration. Complex integration strategies can involve, where profitable, splitting up the production process into specific activities or functions and carrying out each of them in the most suitable, costcompetitive location. More than ever in the past, complex integration strategies allow TNCs that pursue them to maximize the competitiveness of their corporate systems as a whole on international portfolio of location assets. In the process, the dividing line between is becoming increasingly blurred. … which strategies give rise to a new configuration of locational determinants, with a growing emphasis on “created assets”. To attract such competitiveness-enhancing FDI, it is no longer sufficient for host countries to possess a single locational determinant. TNCs undertaking such FDI take for granted the presence of state-of-the-art FDI frameworks that provide them with the freedom to operate internationally, that are complemented by the relevant bilateral and international agreements, and that are further enhanced by a range of business facilitation measures. When it comes to the economic determinants, firms that undertake competitiveness-enhancing FDI seek not only cost reduction and bigger market shares, but also access to technology and innovative capacity. These resources, as distinct from natural resources, are people-made, they are “created assets”. Possessing such assets is critical for firms’ competitiveness in a globalizing economy. Consequently, countries that develop such assets become more attractive to TNCs. It is precisely the rise in the importance of created assets that is the single most important shift among the economic determinants of FDI location in a liberalizing and globalizing world economy. In addition, the new configuration also includes agglomeration economies arising from the clustering of economic activity, infrastructure facilities, access to regional markets and, finally, competitive pricing of relevant resources and facilities. One implication for host countries wishing to attract TNCs undertaking competitiveness-enhancing FDI is that created assets can be developed by host countries and influenced by governments. 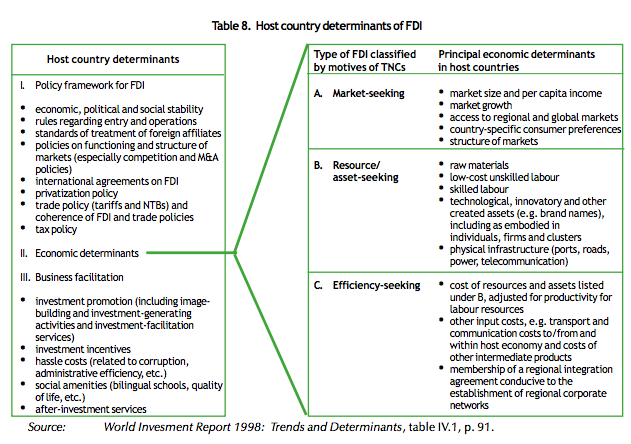 The challenge is precisely to develop a well-calibrated and preferably unique combination of determinants of FDI location, and to seek to match those determinants with the strategies pursued by competitiveness enhancing TNCs. It must be remembered too that created assets also enhance the competitiveness of national firms. Thus, policies aimed at strengthening innovation systems and encouraging the diffusion of technology are central because they underpin the ability to create assets. Also important are other policies that encourage the strengthening of created assets and the development of clusters based on them as well as policies that stimulate partnering and networking among domestic and foreign firms and allow national firms to upgrade themselves in the interest of national growth and development. All in all, the trend towards increased flows of FDI worldwide and the creation of a more hospitable environment for FDI continues. Even the Asian financial crisis does not seem, thus far, to have greatly affected either FDI inflows to, or the further liberalization of FDI policies in developing countries. Liberalization has proceeded at the international level through the proliferation of bilateral treaties and the creation of new regional markets and investment areas. One of the peculiar consequences of recent developments in the FDI area is that, by becoming commonplace, liberal national policy frameworks have lost some of their traditional power to attract foreign investment. What is more likely to be critical in the years to come is the distinctive combination of locational advantages — including human resources, infrastructure, market access and the created assets of technology and innovative capacity — that a country or region can offer potential investors. 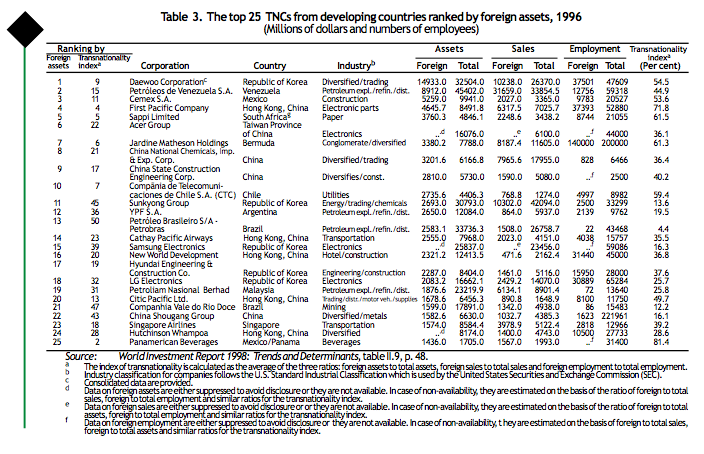 Foreign direct investment set a new record in 1997, expanding and strengthening international production worldwide... ... with the 100 largest TNCs in the world having become highly transnationalized and the 50 largest developing country TNCs catching up. Developing countries continue to be major players in FDI inflows... …despite the strong investment performance of developed countries in 1997. Countries are continuing their efforts to create favourable conditions for FDI, with bilateral treaties and regional initiatives gaining momentum, ... …as governments engage in broad-based and wide ranging discussions on international investment agreements and their development implications. Foreign direct investment has remained a source of relative stability in capital flows to developing countries, ... … showing resilience in the face of the financial crisis in Asia and the Pacific, ... ... although the implications of the crisis for FDI in the most affected countries are a matter for concern. While some effects of the crisis are conducive to increasing inward FDI, ... ... others will affect it adversely. FDI to countries not seriously caught up in the crisis may also decline, ... ....mainly because of decreased outward FDI from some Asian home countries, ... ...making it difficult to predict the overall impact on FDI in the region in the short and medium term, although long-term prospects remain sound. Latin America now tops developing regions in inward FDI growth, due to economic stability, growth, liberalization and privatization, ... …but Africa’s performance has remained unremarkable – with some exceptions. FDI in Central and Eastern Europe has bounced back. The principal determinants of the location of FDI are the policy framework, business facilitation measures and economic factors. The FDI policy framework, a necessary but not sufficient determinant of FDI location is becoming relatively less important with liberalization and globalization ... ... while business facilitation measures are becoming relatively more important. The relative importance of economic determinants, the most important category of determinants, ... …is changing under the impact of liberalization and globalization, as TNCs increasingly pursue competitiveness-enhancing strategies relying on a portfolio of locational assets, ... … which strategies give rise to a new configuration of locational determinants, with a growing emphasis on “created assets”.